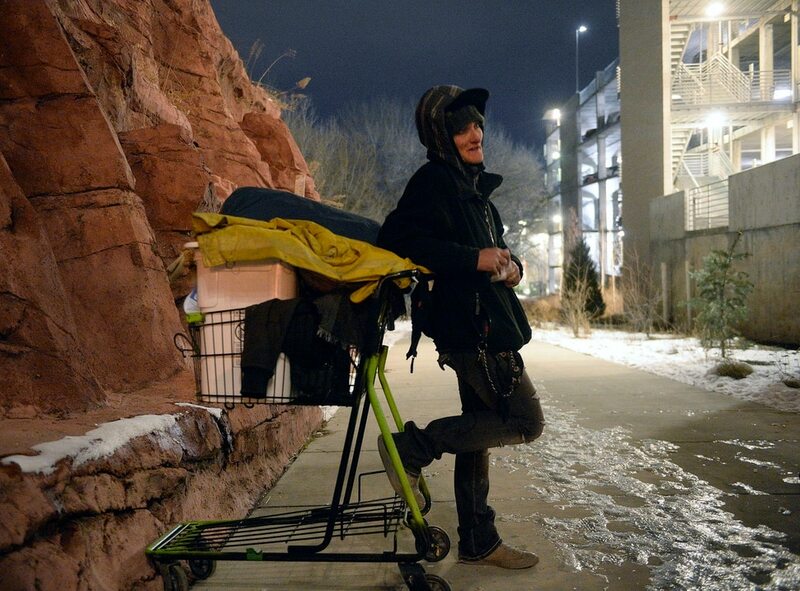 Who are the Utahns who would rather sleep outside in the winter than stay in a homeless shelter? The annual Point In Time head count survey puts names and faces on Utah’s invisible homeless people. 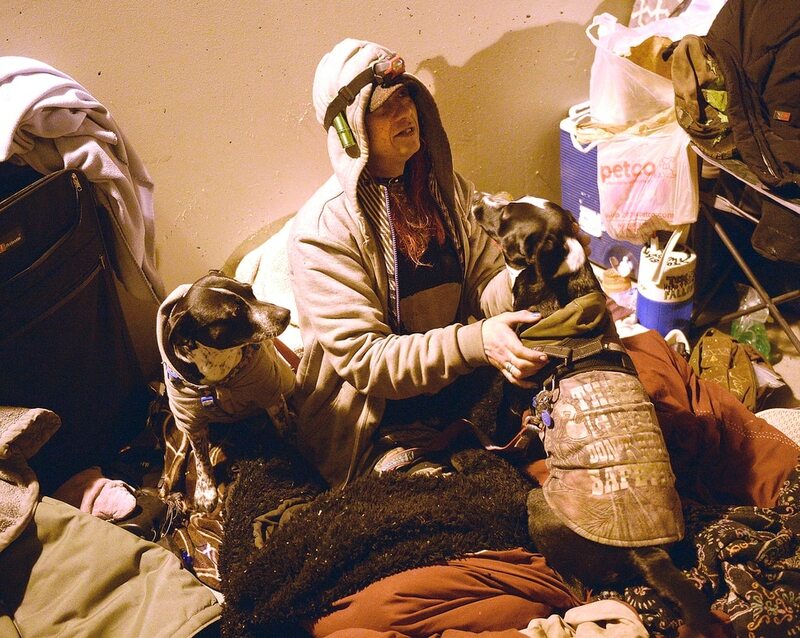 (Al Hartmann | The Salt Lake Tribune) A homeless woman called Thumper is interviewed while cuddled in her bedroll with her dogs Hope and Despair. Volunteers were counting homeless people in Salt Lake City for the annual Point In Time survey at 4:30 a.m. Thursday, Jan. 25, 2018. Thumper had spent the night with a couple friends, camped in the tunnel between Sugar House Park and Hidden Hollow. (Al Hartmann | The Salt Lake Tribune) Charly Swett, with Volunteers of America, right, interviews Thumper for the annual Point In Time count of homeless people in Salt Lake City at 4:30 a.m. Thursday, Jan. 25, 2018. Thumper has been homeless off and on for 25 years, and spent the night with a couple friends camped in the tunnel between Sugar House Park and Hidden Hollow. Hank a friend's dog in foreground. (Al Hartmann | The Salt Lake Tribune) Tammy, who said that she's been homeless for the past 13 years, was pushing her shopping cart up a walkway in Sugar House when she met with volunteers who were counting homeless people for the annual Point In Time survey in Salt Lake City at 5 a.m. Thursday, Jan. 25, 2018. (Al Hartmann | The Salt Lake Tribune) Tammy, who said that she's been homeless for the past 13 years, pulls her cart with belongings into the tunnel at Sugar House Park where a few friends are camping on Thursday, Jan. 25, 2018. (Al Hartmann | The Salt Lake Tribune) Shawn Spalding, with Volunteers of America outreach, right, interviews Tammy, who said that she's been homeless for the past 13 years, during the annual Point In Time count of homeless people in Salt Lake City at 5 a.m. Thursday, Jan. 25, 2018. (Al Hartmann | The Salt Lake Tribune) Volunteers walk through a neighborhood near Hidden Hollow in Sugar House at 4:20 a.m Thursday, Jan. 25, 2018, looking for homeless campers as part of the annual Point In Time survey. (Al Hartmann | The Salt Lake Tribune) Dozens of volunteers dressed for the cold wait to get their assignments at 3:45 a.m Thursday, Jan. 25, 2018, for the annual Point In Time count of homeless people in Salt Lake City. (Al Hartmann | The Salt Lake Tribune) Dozens of volunteers dressed for the cold wait to get their assignments at 3:45 a.m Thursday, Jan. 25, 2018, for the annual Point In Time count of homeless people in Salt Lake City. Thumper was huddled beneath a pile of blankets with her pups near Hidden Hollow in Sugar House on Thursday at 4:30 a.m. But the 39-year-old camper sat up to greet Charly Swett from the Volunteers of America (VOA), who was carrying a clipboard and a survey. Swett and her outreach team were among 70 people Thursday canvassing the out-of-the-way places in Salt Lake County where homeless people camp. It’s part of the annual Point In Time count that is a requirement of the federal Department of Housing and Urban Development (HUD) for funding of local and state homeless services. Thumper has been without a home, off and on, for 25 years, she said. This time around, she hasn’t had a place to call her own since 2013 and has been eking out an existence on the streets of Salt Lake City. The Point In Time exercise is an important requirement for a number of reasons, said HUD spokesman Brian Sullivan. Although the annual count includes people in shelters, it is also the only data gathered on people living outside in Utah, as well as the rest of the country. This year, it includes taking photos of respondents to go with their surveys. Earlier this month, HUD announced grant funding in the amount of $2 billion to underwrite services to the nation’s estimated 550,000 homeless people. Competition for homeless service dollars is stiff, Sullivan said. Utah got $10.3 million this year that will help support 55 local programs. The Point In Time survey seeks to marshal personal data, including age, gender, families, general health, diseases and addictions. It also asks respondents if they are veterans or victims of domestic abuse, and how long they have been homeless. The Point In Time crew, which includes many volunteers, will continue to scour the Salt Lake Valley through Saturday. The information — which is collected statewide — will be compiled and made public in several months. It also will be available in the “2018 Comprehensive Report on Homelessness — Utah,” which is published in October. It will be compared to the January 2017 data. Last year’s count listed as “unsheltered” 278 people statewide, with 2,574 in shelters and temporary transitional housing, for a total of 2,852. That’s up slightly from the 2016 total of 2,807, which was made up of 236 campers, and 2,571 people in shelters and transitional housing. The Point In Time count is a snapshot. Although there were 2,807 people counted as homeless on one night in January 2016, a total of 13,114 suffered from homelessness in Utah that year, as some people found housing, while others lost it. At about 5 a.m. Thursday, a slight figure pushed a shopping cart full of possessions up a dark walkway in Sugar House’s Hidden Hollow. Her name is Tammy, and she’s been homeless for 13 years. During the Point In Time survey, Tammy informed VOA outreach workers Machele Nieto and Shawn Spalding that she is HIV-positive but is doing OK. The VOA team always offers medical help and has a medical coordinator that visits campers on site. The outreach team also offers clothing, sleeping bags and coats, as well as food and water. Adding to the challenge of counting homeless campers this January is that the Operation Rio Grande sweep, designed to reduce crime around The Road Home shelter, led many downtown campers to scatter to other locations. Fortunately, said Rob Wesemann, who heads up this year’s canvass, the Point In Time crew was able to coordinate with the Salt Lake County Health Department, which has been mapping recently established homeless camps. The exercise offers more than just a head count, he explained. Just before 6 a.m., a man pedaling through the dark on a bicycle stopped when the VOA team bid him good morning. His street name is Sic, he said, and he’s 41. Sic told the team he has been homeless since 2015. Sic suffers from extreme anxiety, he said, but gets treatment at the Fourth Street Clinic. After the survey, Nieto and Spalding gave him socks and gloves and a gift card to Smith’s Food and Drug. Sic thanked them and pedaled away. The survey is more than just data collection, according to organizers. It’s also meant to put names and faces on homeless people, along with their challenges, in the hope that each of them will find a way out of homelessness.